Lots of leaders...lots of information....lots of Lions fellowship! 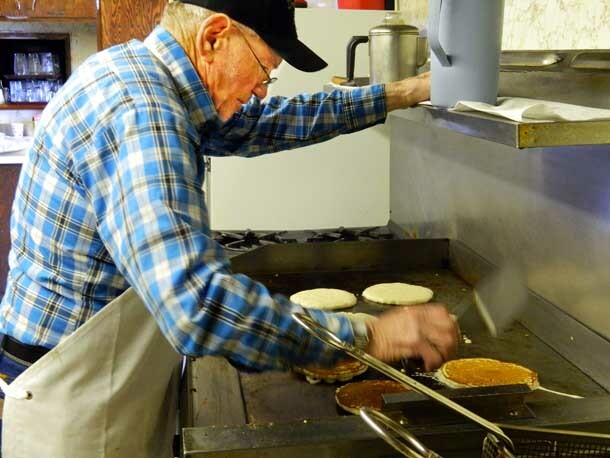 It was a full agenda, with installation of officers, some decisions on key Lion projects, and a program presenter with a candid assessment of the Belle Fourche business climate. 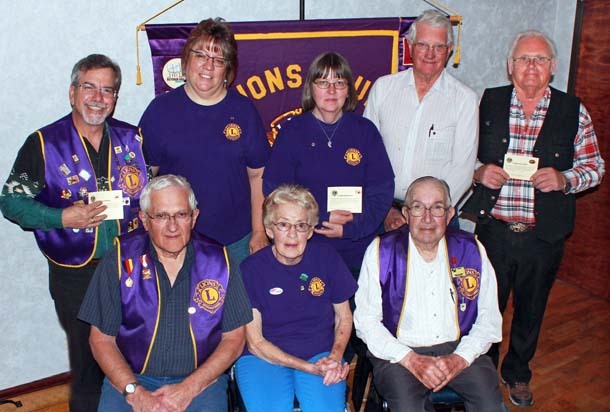 District Secretary Neil Vollmer, accompanied by a contingent of other Lions from the Newell Lions Club, was on hand to lead the installation of officers for the coming year. 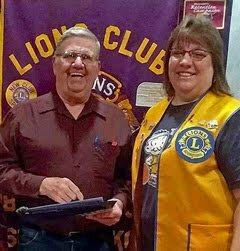 Leading the slate of new club leaders is Lion Joyce Drabek, who becomes the first woman to lead the Belle Fourche Lions Club. 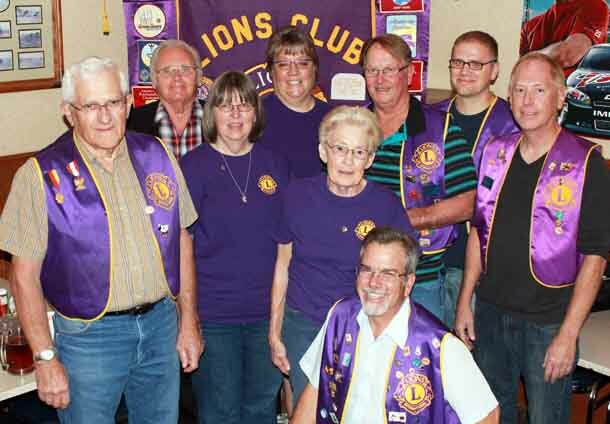 Members of the Northern Lights Lions Club of Belle Fourche, comprised of Lady Lions, merged with the previously all-male club a couple of years ago. Lion President Joyce leads an array of talented members from the Northern Lights club who have infused renewed vigor into the Belle Fourche Lions. 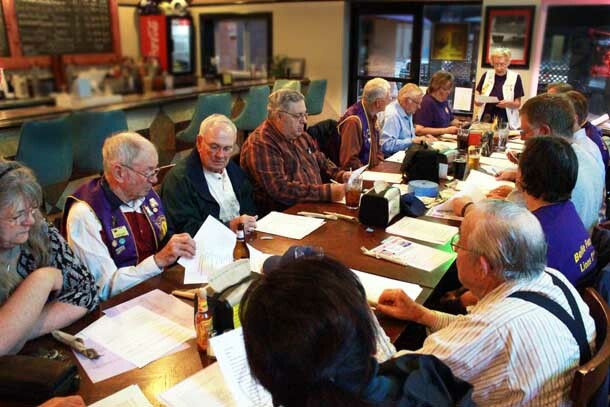 Their impact can be seen in the leadership positions of our club, as well as in the committee assignments. 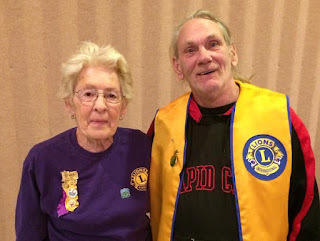 Club leaders for the coming year include: Lion Joyce Drabek, president; Lion Willert, First VP; Lion Kline, Second VP; Lion Zupan, Third VP and Lion Tamer; Lion Rich Drabek, Treasurer; Lion Del Neumesiter, Secretary; Lion Sue Neumeister, Board Member; and Lion Cooper, Tail Twister. 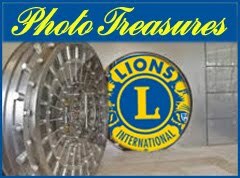 To get a closer look at these club leaders, along with a few other snapshots from the evening, visit our Lions Gallery. New Belle Fourche Chamber of Commerce director Gary Wood (shown at left) gave an assessment of the business climate in Belle Fourche, with some positive information about our community that is often overlooked -- such as the hefty number of manufacturing plants that call Belle Fourche home. 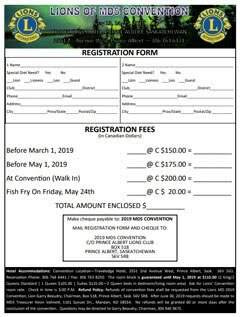 A full slate of business followed installation. 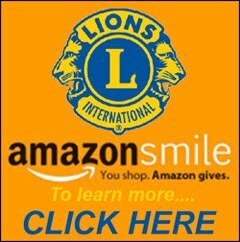 You can read all about it in the timely and comprehensive Minutes compiled by club secretary Lion Del Neumeister. 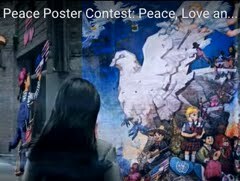 Click the "Minutes" tab at the top of this page. Also lots of upcoming Lions events. 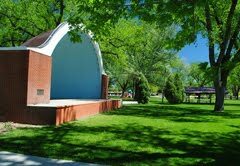 Check 'em out on the "Calendar" tab above or in the right-hand column. 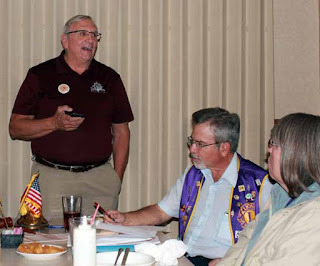 When long-time Lion Harry Haivala took on the duties of chairing the Eyeglass Drop-Box Committee two years ago, he didn't waste any time. 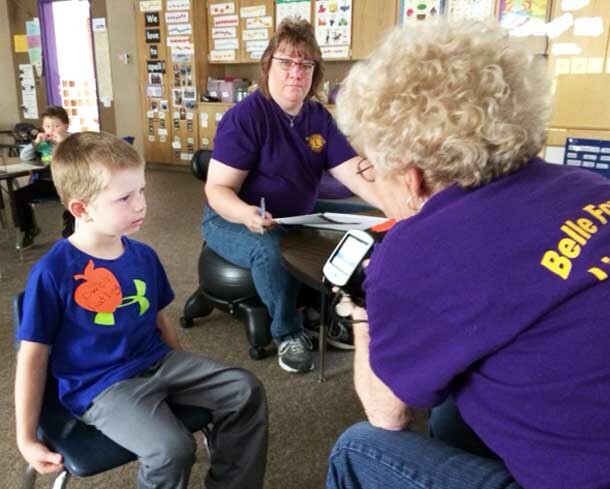 Despite escaping the frigid climes of South Dakota for a few months of warmth in Arizona, he took his work with him! 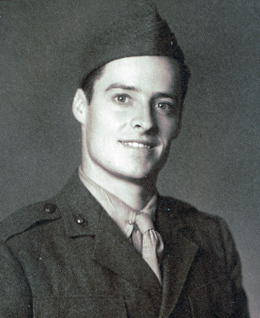 Harry and his wife, Irene, have been going south for 18 winters. 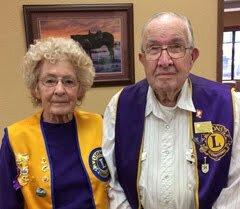 But when he took on the task of coordinating the collecting of used eyeglasses for the Belle Fourche Lions Club, he decided to "expand" the collection area. 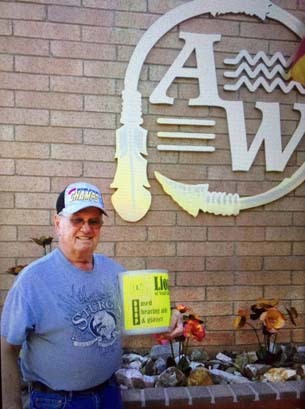 While at his park model home in north Mesa, Arizona, he decided to set up a "South Dakota" collection point for used eyeglasses in the office of their park, Apache Wells RV Resort. "I knew that in a 55+ resort, there would be quite a few new glasses, and no place to go with the old ones, except Walmart." 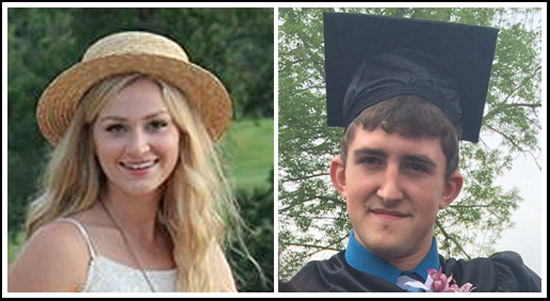 Last season, he collected about 30 pairs of glasses. A retired Game Warden with the South Dakota Game, Fish & Parks department, Harry Haivala was based in Belle Fourche for 27 years. 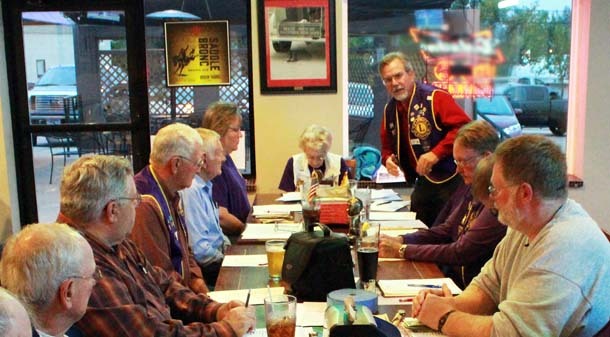 During those years, he appeared as a guest speaker at Belle Fourche Lions. 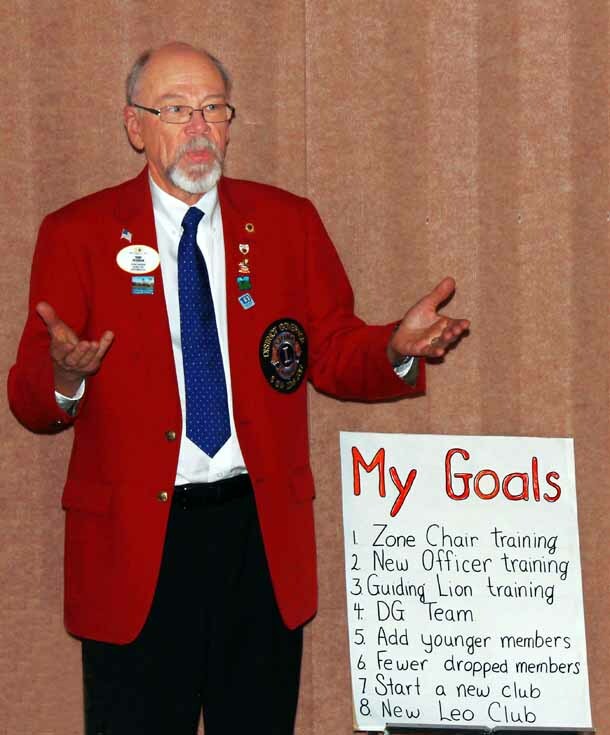 "I decided after I retired to join one civic organization and determined that Lions was the best," Haivala said. 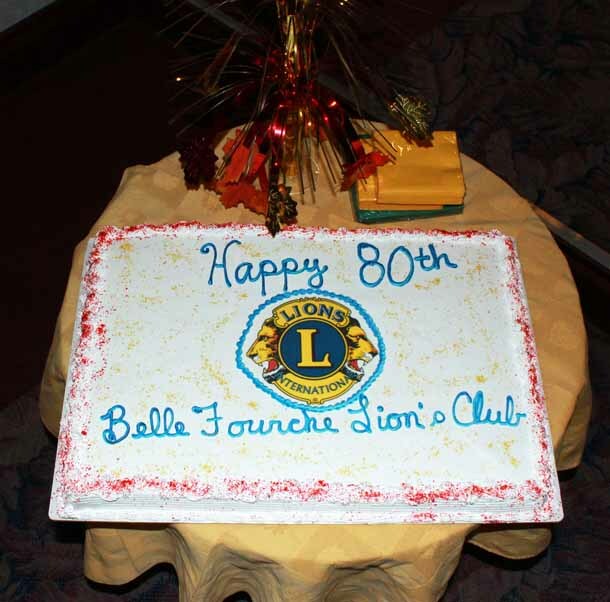 Since 1994, Lion Haivala has been an active member of the Belle Fourche Lions Club. 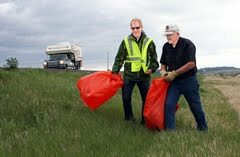 He is also chairman of the Christmas Family Committee and continues to provide leadership for the Adopt-A-Highway Clean-Up. 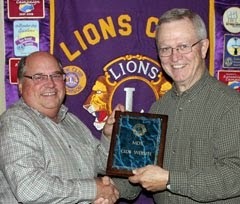 Thanks for your good work, Lion Harry Haivala! Lion Del Neumeister (left), Belle Fourche Lions Club Secretary, received a Membership Pin for "successfully opening the door of Lionism to at least two individuals." 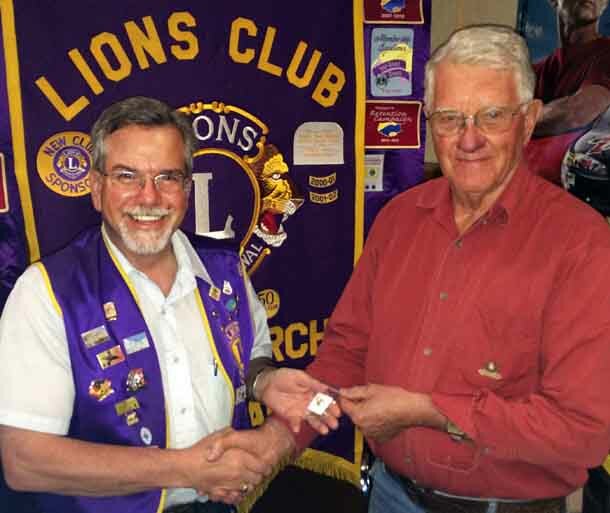 The pin was presented during the May 24, 2016 meeting of the club at The Stadium by president Leo Orme. 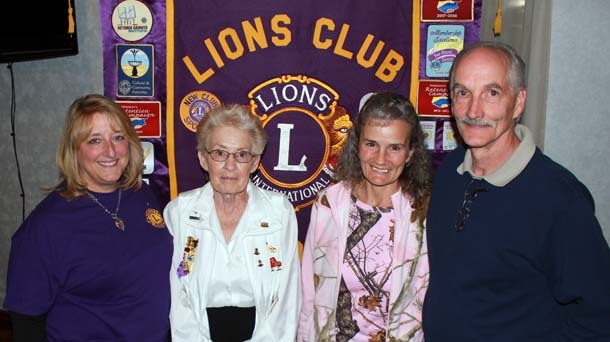 Congratulations and "Well Done, Lion Neumeister!"